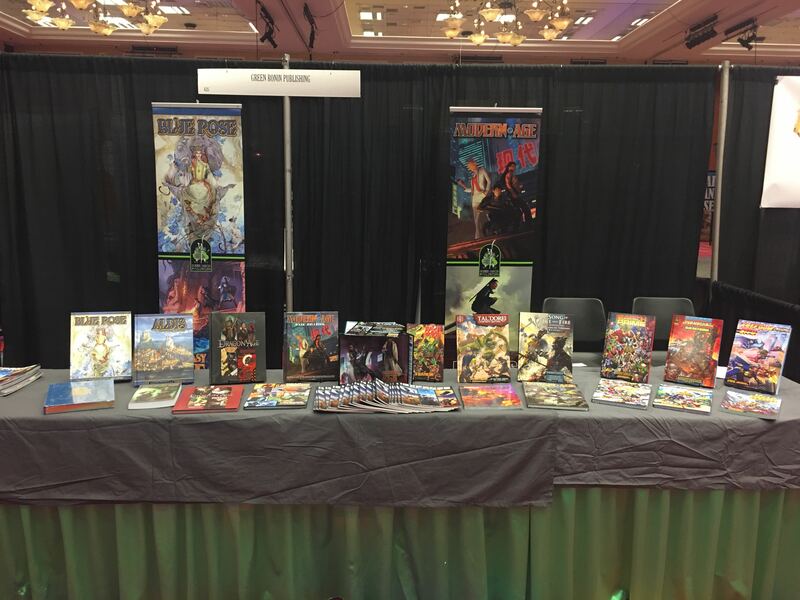 Last week Team Ronin made their way to beautiful Reno, Nevada to attend the GAMA Trade Show. GAMA, the Game Manufacturers Association, puts on this show every year for publishers, retailers, and distributors to get together and talk about their products, policies, and industry news. Publishers put up booths in an exhibit hall where retailers can come chat, check out our wares, and create an environment for feedback and construction. This year we set up our booth and talked with retailers about the upcoming print release of Return to Freeport, which releases in just a few days, and The Expanse which will release to hobby stores on April 23rd, shortly after our backers receive their copies. We also talked about our upcoming slew of releases, which you can read about in Pramas’ posts here, here, and here. Retailers were particularly excited to learn about the plans to support The Expanse, as excitement at the store level is higher than even we expected! The other major topic of discussion with retailers was our Pre-Order Plus program! With so much going on in the industry, we wanted to take the time to educate our partners about this program in person. Tons of retailers were excited about this but hadn’t heard about it before so we used this opportunity to bring it to light so that our retail partners have all the correct tools and support we can provide them. We also had quite a few closed-door meetings with our distributors to discuss issues in the supply chain and the growing market. Scott Thorne, the owner of Castle Perilous Books & Games in Carbondale, Illinois, said a few years ago that he estimated well over 200 SKUs a month which has caused some retailers and distributors some issues. All our partners were understanding and will help going forward! If your local game shop carries our books, make sure to thank them on our behalf. Many of the things at GAMA Trade Show are often behind-the-scenes; the exhibit hall, the meetings, and the seminars are all meant for industry folks – but these things affect our fans as well. Meeting these people and having time to chat makes it easier for us to make our books and get them into stores, which ultimately makes our products more available and more accessible. Finally, we got to chat with some of our peers and have fun talking about the Pun War we had on Twitter with some of our friends. There’s a lot to be said about our industry being built on fun, and being able to make that fun in a different way that we can still share with our fans is satisfying. All in all GAMA Trade Show was a success, and we were happy to see our partners and friends from all over the world. Now we look ahead to The Expanse and beyond – keep your eye on your local game store, and this space, for more of your favorite Green Ronin adventures!